I don’t know if this tops it, but I’m creating the category. The LA Times reports (via CBS Boston) that a couple called 911 on Monday evening after getting lost in this diabolical corn maze in Danvers, Massachusetts. I’m using the word “diabolical” literally because this year’s Connors Farm Corn Maze has a Halloween theme (specifically “Salem Village – Headless Horseman”), and I’m using the word “literally” literally to mean that Satan himself was present within the maze. 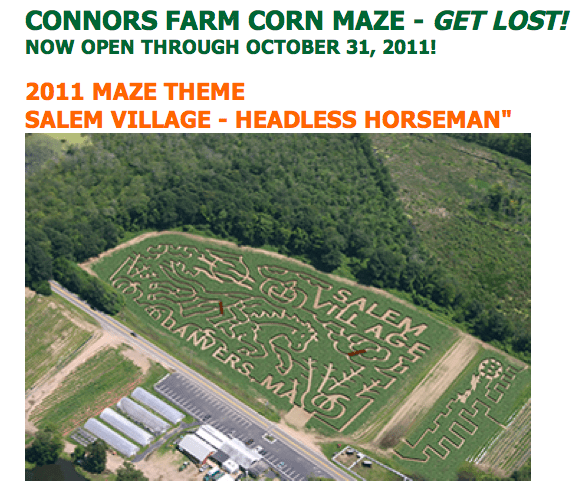 At least I assume something like that was going on in order to make being lost in a corn maze a police emergency. Granted, it was probably pretty dark by then because the maze “closes” at 6 p.m., sunset Monday was at 6:07, and the call was made about an hour after that. This would mean that they had likely been inside for about two hours, given the enter-one-hour-before-closing rule. Also, this couple had a three-week-old baby with them. But I’m still not sure any of this excuses the 911 call, for reasons I will explain below. Woman [in tears, with Boston accent]: Hi, I just called. I’m still stuck at Connors Farms. I don’t see anybody. I’m really scared. It’s really dark and we’ve got a 3-week-old baby with us. Police officer: Okay, just relax. Your husband is with you, right? Woman: Yes. But my baby…. Officer: I understand. A police officer is on the way…. Can I talk to your husband? Officer: Hi, sir, how old are you? Husband: …Yeah, I just can’t believe they didn’t send anybody … the people who run this…. Officer: Well, tell your wife help is on the way…. Don’t let your wife freak out, okay? Husband: Yeah … I see lights over there at the place, but we can’t get there, we’re stuck right in the middle of the cornfield. Officer: Okay, relax, help is on the way….It’s actually a K-9 unit….Can you hear ’em barkin’? … Go ahead and scream out. Officer: Can you put your wife back on the phone? Woman: Thank you …. We thought this would be fun. Instead, it’s a nightmare. I don’t know what made us do this, it was daytime when we came in, we thought if we got lost someone would come around, you know? … Oh, my goodness. The mosquitos … the mosquitos are eating us alive, and I never took my daughter out before, this is the first time. Never again….Thank you guys so much. Officer: No problem. It’s what we do. YOU SAID YOU CAN SEE LIGHTS. WALK TOWARD THEM. WALK THROUGH THE CORN AND GO TOWARD THE LIGHTS. Do not call 911 and please, do not sue the operators of the corn maze or I will be mentioning you again. This advice may prove especially useful on Haunted Cornfield nights. Please note: Haunted Cornfield night is not recommended for younger children. Most 42-year-olds should be fine. Update: MSNBC reports that the callers were marooned just 25 feet from the exit.